MERLE, JACQUES, named Father Vincent de Paul, Roman Catholic priest and Trappist; b. 29 Oct. 1768 in Chalamont, France, son of Charles Merle and Louise Gagnon; d. 1 Jan. 1853 in Tracadie, N.S. Jacques Merle was born into a devout Roman Catholic family. His father, a surgeon in Chalamont, sent him to a Jesuit college in nearby Lyons. Despite the outbreak of the French revolution in 1789, Merle began studies for the priesthood, apparently intending to enter the Order of Cistercians of the Strict Observance. This order, commonly known as Trappist, combined religious contemplation, prayer, and penance with manual labour in a secluded communal life. In 1790 religious orders were suppressed in France so Merle entered a monastery at Val-Sainte, Switzerland, which had been established by Dom Augustin de Lestrange and other French Trappists. Merle stayed six months; ill health prevented him from following the austere régime and he returned to France, where he secretly completed his theological studies. Ordained clandestinely on 7 April 1798 in Lyons, he worked as a catechist in that diocese until his arrest. He managed to escape and from 1799 taught rhetoric at seminaries in France. His health improved and, determined to enter the Trappists, he returned to Val-Sainte, probably in January 1804. He pronounced his vows on 13 Oct. 1805, taking the name Vincent de Paul. The following year, when Napoleon requested that the Trappists establish a hospice for French troops crossing the Alps into Italy, he and two monks founded a monastery-hospice at Montgenèvre. He remained there until 1811 when all Trappist monasteries were ordered closed by Napoleon because of the order’s support of the papacy. Trappists had searched throughout Europe, without much success, for a place where they might worship free from restriction. In August 1812 Vincent de Paul and two monks arrived in Boston with orders to establish a monastery near Baltimore; three other Trappists arrived the following year. They cleared the land, built log huts, and planted crops. By the summer of 1813 the marshes and the insects had taken their toll; all became ill and three died. Meanwhile, Lestrange summoned Vincent de Paul and other Trappists to join him in New York in a renewed effort to develop a monastic community in the New World. On hearing of Napoleon’s abdication, however, Lestrange decided that they should return home. Leaving Vincent de Paul and six others to sell the property, he sailed for France. Vincent de Paul and his companions left New York in mid May 1815 and arrived in Halifax 15 days later. Edmund Burke*, vicar general of Nova Scotia, quickly formed a favourable impression of the pious and zealous Trappist. With Burke’s help, Vincent de Paul secured passage to England for himself and the others. The group was obliged to wait two days for favourable winds and Vincent de Paul went ashore to secure extra provisions; when he returned, the boat had departed and all efforts to regain it were futile. In a strange country with little command of English and only a guinea and a worn-out cassock, he began a new sacerdotal career. Although he has been accused by Trappist historians of deliberately missing his passage because of his firm attachment to the North American missions, there is nothing to suggest the event was not an accident. Yet, throughout his career he demonstrated a talent for ignoring orders that did not suit his purpose and for turning to the advantage of himself and the Trappists the overlapping jurisdictions of French and British North American religious authorities. Burke was delighted to have another priest to aid the ailing Pierre-Marie Mignault*. In July Vincent de Paul met the bishop of Quebec, Joseph-Octave Plessis*, then on a pastoral visit to the Maritimes. Plessis saw in Vincent de Paul’s misadventure a providential opportunity to develop a plan that he and Burke had long cherished, a central mission for the Micmacs of the province administered by Trappists living in a nearby monastery. Skilled in agriculture and accustomed to physical labour, the Trappists would be well suited to instruct the Micmacs and, as Plessis argued in a letter to the lieutenant governor of Nova Scotia, Sir John Coape Sherbrooke*, seeking the British government’s approval, the self-sufficiency of the order would mean little cost to the government. Plessis and Vincent de Paul had agreed that, while they awaited approval from both London and Lestrange, the Trappist would spend the winter with another French émigré priest, Jean-Mandé Sigogne*, in order to learn Micmac. Mignault’s ill health prevented Vincent de Paul from leaving Halifax that winter, but he probably spent the winter of 1816–17 in Sigogne’s mission among the Acadians of southwestern Nova Scotia. During most of 1815–17, however, he worked in the Halifax area, preaching, preparing a candidate for the priesthood, and ministering to the Micmacs there and in Shubenacadie as well as to the Acadians at Chezzetcook, whom he described as “ignorant, not very industrious, but naturally good.” He also acted as doctor at Chezzetcook, perhaps drawing upon medical training he had acquired from his father. None the less, by 1817 government approval for his plans had not arrived and he was ordered by Lestrange to found a Trappist monastery or return to France. Although he longed for spiritual renewal in a cloistered monastery in France, he realized the need for Catholic priests in Nova Scotia. His work among the Micmacs was progressing despite his having to speak through an interpreter, and he was concerned that in the absence of priests many Micmacs would fall under the influence of Protestants, especially Walter Bromley*. He also had hopes of founding a religious establishment at Chezzetcook, where he had purchased 50 acres. Searching for possible sites for a monastery, he made missionary visits to the northern mainland and, with the assistance of Father François Lejamtel*, to Arichat and Bras d’Or, Cape Breton. In late 1818 or early 1819, after frequent consultations with Plessis, he purchased 300 acres near Tracadie. “It is a long and deep valley in the middle of which a little river runs. . . . Two quite high mountains serve as ramparts, one on each side. The land here is excellent. We can have plenty of hay, wheat, potatoes, and all sorts of other vegetables. This property is only half a mile from the sea on a good site with good air.” The nearby villages of Pomquet, Tracadie, and Havre Boucher, settled by Acadian, Scottish, and Irish families, might provide recruits for the monastery, and in May 1819 he wrote Plessis that a number of young people were interested in becoming novices. Named parish priest for the three communities in 1818, Vincent de Paul soon realized that his impoverished parishioners were unable to pay the yearly tithe of one louis, and in general were less devout than the Micmacs. In 1821, during an unsuccessful trip to Lower Canada to raise funds for the monastery, he was disturbed by the pessimism of his host, Jean-Henry-Auguste Roux*, superior of the Sulpicians, concerning the possibility of establishing it on a sound footing. He persevered, despite a constant lack of funds, with a variety of projects, some only remotely connected with the monastery. While in Montreal, he arranged for the Congregation of Notre Dame to instruct without charge some young novices who would then be able to educate Nova Scotian girls for religious vocations; three girls from Pomquet and Tracadie left for Montreal in July 1822. A building large enough for 12 to 15 monks had been constructed by 1820, and another, attached to the church at Tracadie, was completed by 1821 to serve as a convent and a school for girls. The convent opened two years later when the three girls returned and took their vows as Trappistine sisters. Vincent de Paul also hoped to open a school for the children of some 30 black families in a community near the monastery and had set aside 50 acres to support a teacher. In addition to his duties as a parish priest, he served as a missionary to the Micmacs on the mainland and on Cape Breton Island. In 1822 he was named vicar general for the islands in the Gulf of St Lawrence that were in the diocese of Quebec, including, at that time, Cape Breton. In 1823, in view of the precarious nature of his efforts in Nova Scotia, Lestrange ordered him to join a group of Trappists in Kentucky. Reluctant to abandon Tracadie and anxious to return to France to explain his problems to his superior, but fearing to disobey orders, the hesitant Trappist turned to Plessis. In a letter combining fatherly concern and ill-concealed exasperation at what seemed another example of Vincent de Paul’s indecisiveness, Plessis supported his decision to return to France. Vincent de Paul sailed in October 1823, leaving his affairs in the hands of Hyacinthe Hudon*, parish priest at Arichat. While in France, besides consulting with Lestrange and other Trappist superiors, he wrote a memoir, which gave a brief account of his travels in the United States and Nova Scotia, emphasizing his work among the Micmacs and stressing the need for priests and funds. 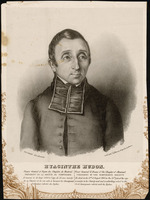 A short excerpt from the work was published in the Annales of the Society for the Propagation of the Faith in 1826, and the society granted him 1,500 francs for his mission. Vincent de Paul returned to Nova Scotia in June 1825. With him on the voyage were four Trappists; two more would follow. At the suggestion of Plessis and Lestrange, he petitioned the lieutenant governor, Sir James Kempt, to obtain government approval for the monastery and thus secure its future. No reply was received, but the new recruits gave the monastery, which he called Petit Clairvaux, some stability. Johann Baptist Kaiser, named François-Xavier, the only priest among the new arrivals, assumed the administration of the monastery while Vincent de Paul resumed his parochial duties and missionary work. He also had a grist-mill constructed in 1832 to serve both the monastery and the surrounding communities. The 1830s and 1840s were difficult years for Petit Clairvaux. The death of Lestrange in 1827 had deprived it of a devoted superior and loyal protector. In 1834 a papal decree unified all Trappist orders in France and reverted to the rule in existence before Lestrange’s reforms. Petit Clairvaux, unaffected by the decree, followed Lestrange’s strict régime but was increasingly looked upon as an orphan by the French Trappists. Anxious for replies to his appeals for assistance and new recruits, the 67-year-old Vincent de Paul returned to France in 1836. The vicar general of the order persuaded him to close Petit Clairvaux. Vincent de Paul seems to have fully accepted this advice and sent detailed instructions to that effect to Father François-Xavier. The monks themselves were to go to a monastery in England. After visiting England the restless Vincent de Paul returned to France to collect funds for the English Trappists, and perhaps also to obtain another opinion about Petit Clairvaux. He then journeyed to Rome to discuss the problem with ecclesiastical authorities. On 9 April 1838 a papal decree placed Petit Clairvaux, with its 10 to 12 monks, and the convent, with its 9 religious, under the jurisdiction of the vicar apostolic of Nova Scotia, Bishop William Fraser. At about that time Vincent de Paul received a letter from Fraser, asking that the Trappists remain in the province and that he return. Fraser’s request was probably exactly what he was seeking. He justified his return in a letter to the vicar general of the Trappists in March 1840 on the grounds that he could not disobey his new superior, and sailed from France shortly afterwards. The French superior, in a letter written on 1 February to the parish priest at Arichat, Jean-Baptiste Maranda*, referred to Vincent de Paul as a “vagabond,” thus arousing the ire of the Nova Scotian clergy who held the aged missionary in esteem. This letter is evidence of the strained relations between the two men as well as of their differing views of the role of a Trappist monk. Vincent de Paul handed the administration of Petit Clairvaux to François-Xavier on his return and retired to the Trappistine convent. He none the less maintained an active interest in the affairs of the monastery. In February 1843 he wrote to Bishop William Walsh, requesting permission to collect funds in Halifax to complete a chapel which had been built with the generous assistance and labour of the people of Tracadie. A few weeks later he wrote again, explaining that on 19 February fire had destroyed a hostelry for visitors and the building containing the supplies for the monastery. The grist-mill, sawmill, cellar, and barn were saved as was the newest building, in which the monks resided. After François-Xavier was unsuccessful in 1846 in another attempt to plead the cause of Petit Clairvaux in France, he, Vincent de Paul, and the ten remaining monks petitioned Rome for a decree affiliating them with one of the stricter Trappist monasteries in France which seemed willing to send them subjects. That plan fell through and the next year a second petition went unanswered. In 1848 an offer of Petit Clairvaux as a refuge to Trappists who might be obliged to leave France because of revolution received a polite refusal and then one final attempt at reconciliation by Vincent de Paul was ignored. After making arrangements which included bequeathing the property of the monastery and convent, held in his name, to the bishop of Arichat, Vincent de Paul died in 1853. The monastery would receive no recruits until 13 Belgian monks arrived in 1857–58 to usher in an era of prosperity. From 1903 to 1914 the monastery was again occupied by French Trappists, but it then remained empty until its purchase in 1937 by the Order of St Augustine, which continues to occupy it. Vincent de Paul had readily discerned the spiritual, educational, and material needs of the small, dispersed communities in Nova Scotia, and his indefatigable work on their behalf, together with his saintly life of mortification and prayer, made him one of the most beloved and revered missionaries in the province. Miracles were attributed to his intercession and steps were taken in 1905, without success, for his beatification. In 1868 a settlement of Tracadie was renamed Merland in his honour. Throughout his missionary work, Vincent de Paul never lost sight of his original training as a Trappist and yearned for the life to which he had pledged himself. His correspondence reveals the many doubts he had about establishing a monastery, but also the many possibilities he envisaged in the New World. Although anxious to defer to his ecclesiastical superiors, he was accurately described by Trappist author Thomas Merton as “one of the most tenacious Trappists that has ever lived.” His refusal to abandon his dream enabled him to succeed in establishing the first Trappist monastery in British North America. Jacques Merle, named Father Vincent de Paul, is the author of an autobiography, “Mémoire de ce qui est arrivé au P. Vincent de Paul, religieux de la Trappe; et ses observations lorsqu’il étoit en Amérique où il a passé environ dix ans avec l’agrément de son Superieur,” published in Relation de ce qui est arrivé à deux religieux de la Trappe, pendant leur sejour auprès des sauvages (Paris, 1824). An English translation of Merle’s account by A. M. Pope was published in Charlottetown in 1886 under the title Memoir of Father Vincent de Paul, religious of la Trappe. AAH, Edmund Burke papers; William Walsh papers (mfm. at PANS); St Anselm’s Roman Catholic Church (West Chezzetcook, N.S. ), reg. of baptisms, marriages, and burials (mfm. at PANS). AAQ, 210 A, VIII: 346, 348, 351, 358, 529, 543; IX: 103, 143, 145, 398; XI: 41, 209; XII: 326; 31 CN, I: 130–130a; 312 CN, V: 89, 93–94, 97, 99–100, 103, 106–9, 111, 113, 115–19. AD, Ain (Bourg), État civil, Chalamont, 30 oct. 1768. Arch. de l’Abbaye cistercienne (Oka, Qué. ), A 1000. PANS, MG 100, 239, no.22; 242, no.34; RG 1, 232: 41; 430: 153; RG 5, P, 51, no.109. N.S., House of Assembly, Journal and proc., 1832: 157, 203, 249. J.-O. 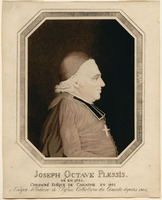 Plessis, “Le journal des visites pastorales en Acadie de Mgr Joseph-Octave Plessis, 1811, 1812, 1815,” Soc. hist. acadienne, Cahiers (Moncton, N.-B. ), 11 (1980). Caron, “Inv. de la corr. de Mgr Plessis,” ANQ Rapport, 1927–28, 1928–29. Éphrem Boudreau, Le Petit Clairvaux: cent ans de vie cistercienne à Tracadie en Nouvelle-Écosse, 1818–1919 (Moncton, 1980). André Coté, “L’ordre de Cîteaux et son établissement dans la province de Québec, depuis la Révolution française jusqu’à 1935” (thèse de ma, univ. Laval, Québec, 1971). A. A. Johnston, Hist. of Catholic Church in eastern N.S. L. J. Lekai, Les moines blancs; histoire de l’ordre cistercien (Paris, 1957). Lemieux, L’établissement de la première prov. eccl. [D.-A. Lemire-Marsolais, named Sainte-Henriette, et] Thérèse Lambert, named Sainte-Marie-Médiatrice, Histoire de la Congrégation de Notre-Dame (11v. in 13 to date, Montréal, 1941– ), 7: 15–18. Thomas Merton, Aux sources du silence, Jean Stiénon du Pré, trad. (5e édit., Bruges, Belgium, 1955). Luke Schrepfer, Pioneer monks in Nova Scotia (New York, 1947). Éphrem Boudreau, “Le Petit Clairvaux (1825–1919),” Soc. hist. acadienne, Cahiers (Moncton), 7 (1976): 131–46. A. M. Kinnear, “The Trappist monks at Tracadie, Nova Scotia,” CHA Report, 1930: 97–105. Paulette M. Chiasson, “MERLE, JACQUES, Father Vincent de Paul,” in Dictionary of Canadian Biography, vol. 8, University of Toronto/Université Laval, 2003–, accessed April 24, 2019, http://www.biographi.ca/en/bio/merle_jacques_8E.html.